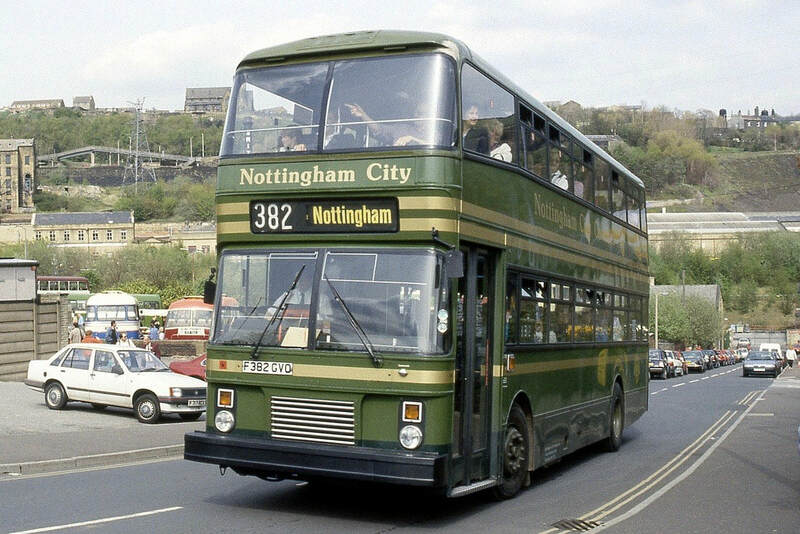 382 was one of a batch of 10 supplied to Nottingham City Transport in 1989, with bodywork by East Lancs. Five were supplied as standard buses, whilst the other five, of which 382 is one, were specified with coach seating for private hire work. It is built to what is known as the “Nottingham Standard” design, which gave Nottingham’s buses a distinctive look for many years. Features included an angled destination making it easier to see, higher internal ceilings, curved upper deck front windows and windscreens, a large front bumper to reduce accident damage, and a standardisation of parts between different vehicles for ease of maintenance. The Leyland-DAB Lion was a mid-engined double-decker bus chassis manufactured by Leyland between 1986 and 1988. The chassis was based on a Danish Automobile Building design. Only 32 were built and were bought by Clydeside Scottish, Eastern Scottish and Nottingham City Transport. It was intended to compete with the Volvo Citybus mid-engined chassis, of which Trent’s F600 GVO is an example. Following the takeover of Leyland by Volvo, the Lion ceased production in 1988. As new, it was painted in Nottingham City Coaches livery, known as Harrods livery, before being repainted into a green and cream scheme. After service it passed to Andrews of Tideswell, who re-registered it as VIL 3382, and later to Moving People. It was later acquired for preservation, and has now been donated to the charity. 382 is generally mechanically sound, but will need considerable repair work to the body structure to bring it back to as new condition. This bus is important to the collection as it represents the last batch of buses built with the “Nottingham Standard” features, which set Nottingham’s buses apart from other operators for many years. It also represents an example of a relatively rare chassis.